Churchill, Manitoba is an excellent location for viewing the Northern Lights perform their magical display in the night sky. The moon shines brightly across the landscape of the Hudson Bay and the town of Churchill, Manitoba as the Northern Lights dance throughout the sky. Incredible lights like these, also known as the Aurora borealis, are fairly common around Churchill, Manitoba and getting a prime viewing spot is easy so you are able to watch this natural phenomenon in action. Bright stars shimmer in the night sky where the Northern Lights show off their magic with the moon enlightening the Hudson Bay below the show. The night glow from the town of Churchill, Manitoba also seems much brighter when the Northern Lights appear above. Photo of the Northern Lights above the town of Churchill, Manitoba when viewing is exceptional with the lights and moon. ... there have been many theories regarding the hows and whys of the Northern Lights but only a true astronomer really understands how these spectacular displays of light come about. There is also a long list of different folklore tales about the Northern Lights that have arisen from many different cultures. The best thing to do if you see the Northern Lights while visiting Churchill, Manitoba is to find a comfortable viewing spot and watch the lights dance amongst the stars. No need to dig deep into the scientific meaning of the Northern Lights as the display put on is more than enough magic in one evening. 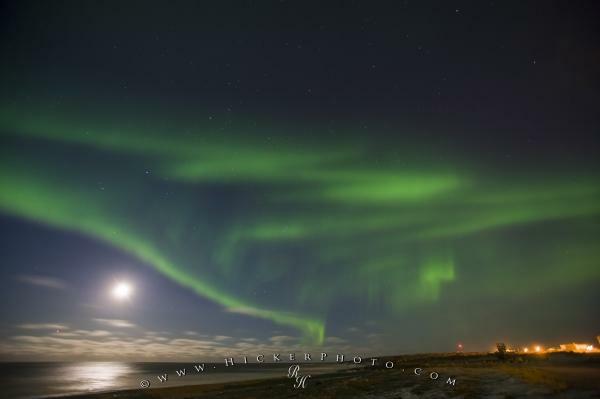 Northern Lights, Aurora borealis, above Hudson Bay and the town of Churchill with a bright moon, Manitoba, Canada. I photographed this photo with the digital SLR camera model Canon EOS-1Ds Mark II, aperture of f/2.8, exposure time of 1/0.066666 sec. on ISO 200, as always I used a original Canon Lens, the focus lenght for this picture was 16mm.